RONAN - Today is Sandra's day. 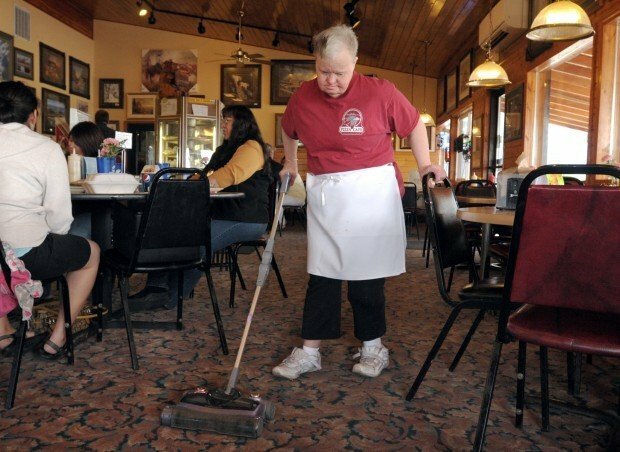 Through it all she has bused tables, washed dishes, served sodas, vacuumed floors and kept her boss, Pizza Café owner Burton Cannon, in stitches. "You've been driving me crazy for 10 years," he'll tell her. "Oh, yeah?" she'll fire back. "Maybe you should go on Letterman and tell your jokes." He calls her "the old battle ax." She calls him "the old goat." "She cracks me up," Cannon says. "I absolutely love her. We'll get to laughing so hard I get worried she's going to cut her air off." And that is a concern. Twice in these 10 years, Sandra Mary Brickzin has passed out at work. "She has trouble with her esophagus," Cannon explains. "Both times I hollered, ‘Call 9-1-1!' and both times, EMTs were sitting in the restaurant eating lunch. They were with her in two seconds, and had her in the hospital within five minutes." And both times, as she was being wheeled out on a stretcher to the ambulance, Sandra cried out to Cannon, "Burt, I'm so sorry. Please don't fire me, Burt, please!" Fire her? Good grief. Who's going to fire the Pizza Café's employee of the decade? Cannon opened the Pizza Café on April 1, 2000. A month later a group from Mission Mountain Enterprises - which provides services to people with intellectual disabilities - was having lunch there. "They asked if I'd be willing to hire any of their kids," Cannon says. "They said they had someone who was working at Plum Creek mopping floors but really didn't like it there. They said they thought she'd make a wonderful dishwasher, and I hired her on the spot." Cannon says it turned out Brickzin, who was born with Down syndrome, had once worked as a dishwasher in the same building when it housed a previous restaurant, and had been fired from that job. "But it's about more than doing dishes," he says. "Just having her here is the payoff." Her smile is priceless, and she takes her duties seriously. "I like to vacuum," Sandra says, and bookkeeper and waitress Dara Rodda says the staff knows it. "There's hell to pay if the vacuum isn't plugged in when Sandra gets to work," she says. "I always tell her if she likes to vacuum, she should come to my house. But we all love working with Sandra - she's such a great gal, just awesome." Health problems have cut her back to just a couple of days a week, a couple of hours at a time. "But their jobs are so important to them," says Cannon, who has employed half a dozen people from Mission Mountain Enterprises over the years, including a 48-year-old man who washes dishes for him now. "They're so appreciative of having a job, and that's not always true of all your employees." "Boys are neat, and girls have stinky feet," Cannon will tell Sandra, which always produces an indignant "No, sir!" and a correction to which gender's feet smell. The boss and his employee are fun to watch at work together, but the relationship between Brickzin and Cannon has grown beyond the restaurant over the 10 years. "She has my cell phone number," Cannon says. "She'll call me up (from the group home where she lives) and say, ‘Burt, get me out of here! What's-her-name is screaming again,' or ‘What's-his-name is running around naked with his toy gun again.' "
Cannon will rescue Sandra. It may be as simple as taking her for a walk downtown, or to his home to watch television. He also takes her on boat rides on Flathead Lake, and to Missoula to shop. "Oh, good grief," Sandra says. "He takes me to ‘Wally World.' He tells me, ‘That's where the devil shops.' "
She's become part of the family, really. Cannon took her to his daughter's wedding, and Sandra still delights in telling people the bride and groom were named Erin and Aaron. Brickzin loves to play with Cannon's grandchildren. The youngest, still a baby, she calls beautiful. "BUE-TEE-ful," Cannon says. "That's how she always pronounces it." Recently, someone mentioned to Cannon that Sandra's age - she's 53 - is getting pretty advanced for a person with Down syndrome. It cut Cannon to the quick. "I really can't imagine life without Sandra in it," he says. "I really want to make these years the best for her." The extra effort starts Sunday, when - in front of all the people Mission Mountain Enterprises serves, many of Sandra's brothers and sisters, the staff at the Pizza Café and any of Sandra's friends who want to stop by - Cannon officially names her his employee of the decade. He took her to Missoula recently. Sandra spends much of the money she earns at the Pizza Café on coloring books and crayons - there reportedly is barely a coloring book left between Kalispell and Missoula she hasn't filled in - and so of course they headed to "Wally World" to see if there were any new ones. But Cannon also took her shopping for several new outfits. They got her hair done. Then they had her portrait taken for the "employee of the decade" poster. Cannon also collected pictures of Sandra as a baby, as a teenager, as a young woman, and took more of her with her friends from Mission Mountain Enterprises, to include. "I can't wait to unveil it," he says. "It's going to be really special." He'll bake a whole bunch of pizzas for the party. The Singing Sons of Beaches will drop by to serenade Sandra, although the local band isn't doing it for free. "We're singing for pizza and hugs," band member Steve Riddle told Cannon, and hugs are among Sandra's favorite things to pass out. "I call her ‘Hugasaurus Rex,' " Cannon says. "The last couple of years she hasn't been able to do as much as she used to, and I've spent a lot of time visiting Sandra in the hospital here or down in Missoula. "But you know, she's always kept her wit, she's always been a trouper. If you're ever down in the dumps all you have to do is go over to Mission Mountain Enterprises and talk to any of those kids. They've got all kinds of stuff going on in their lives. So many of them have serious health problems, but they're always all in a good mood. If you walk out of there still bummed out about your life, there's something wrong with you." For her part, Sandra says she's nervous about Sunday, but excited, too. We're guessing she'll enjoy it as much as Cannon has enjoyed planning it. It's Sandra's day, and it's been 10 years in the making.